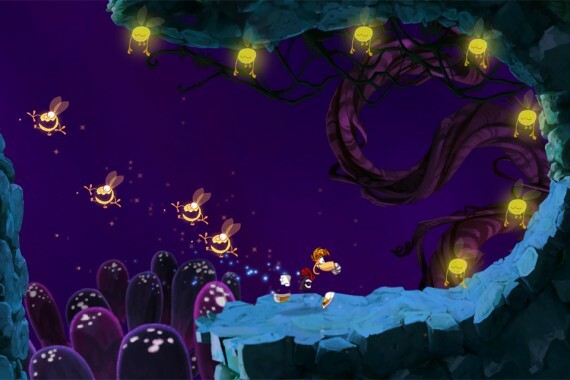 Last year Ubisoft rebooted the Rayman franchise with the stellar Rayman Origins. A stunningly beautiful, wonderfully whimsical platformer that could hold it’s own against even some of Nintendo’s best efforts. As is often the case however, when a full console release makes it’s way to IOS and is reduced to employing a simple touch interface, I was concerned that it would retain little of it’s former glory. Thankfully my doubts were assuaged almost immediately upon playing the game. Developers Ubisoft and Pastagames have focused on recreating the feel of the speed-run bonus levels from Origins, (which were arguably some of the best stages of the game), and have solved the touch-control issues masterfully. So prepare yourself to run, jump, fly and punch your way through 40 exhilarating levels, collecting hidden coins and Lums like a speed-addled, limbless madman! 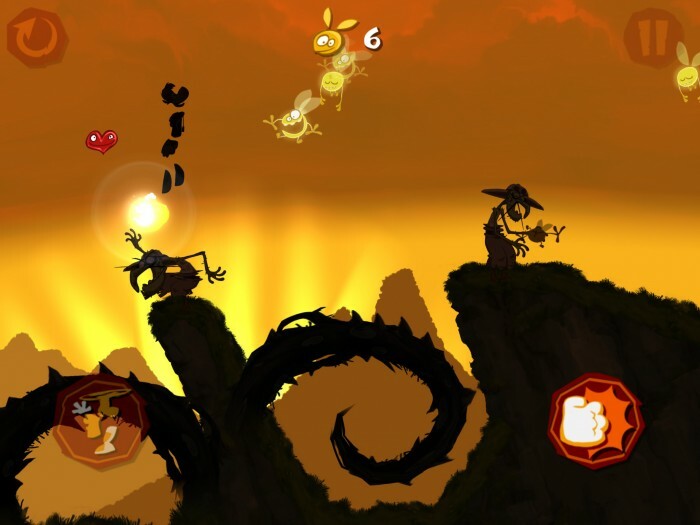 Rayman Jungle Run’s silky-smooth gameplay revolves around an auto-run system, whereby your character is always sprinting towards the finish line. You as the player, will have to use his other abilities to guide him safely through the course, avoiding hazards and navigating obstacles along the way. However getting to the goal is the easy part and if that’s all you’re interested in, this game will only last you a couple of hours at the most. The real challenge comes in the form of collecting the hidden coins and hovering Lums that are scattered throughout the levels. This can take hours of practice and will test your memory and reflexes to the very limit. Whenever you amass all the collectables in a stage you will receive a red ruby-tooth as a reward. Collect 5 of them in any one world and you will unlock a devilishly difficult Land of the Dead bonus level, which will have you swearing like a particularly foul-mouthed sailor, shocking old ladies on the bus with your uncontrollable outbursts of frustration. Each of the 4 worlds adds an ability to your arsenal, most of which employ a ‘touch anywhere’ mechanic. To jump all you have to do it tap the screen and once airborne simply tap and hold to glide utilising Rayman’s classic hair-copter manoeuvre. Wall running is automatic and punching is the only move that requires you to hit a virtual button (located in the lower right hand corner) to execute. 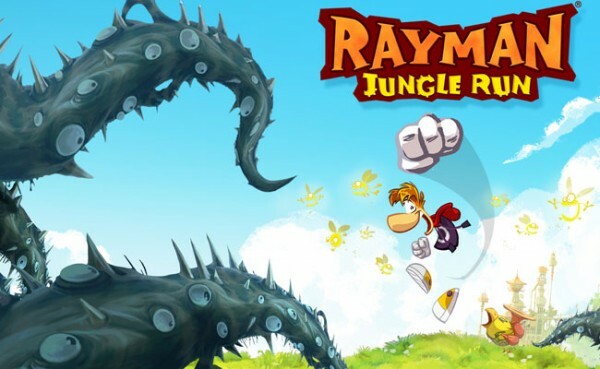 Towards the end of the game you will find yourself tapping away at your touch device like a manic woodpecker, constantly taking advantage of all of Rayman’s skills to keep your race from coming to a premature finish. One of the things fans of Rayman Origins will notice is that the idiosyncratic and often hilarious music from the aforementioned retail release has returned for this IOS expedition. For me this is certainly a welcome addition as the musical score is one of the things I especially enjoyed about Jungle Run’s console counterpart. Unfortunately only a handful of songs have actually been included, so you may find yourself growing tired of the quirky compositions you once loved, which is a bit of a shame. On the plus side however, achievements, unlockable art and competitive leaderboards have been added which will keep you coming back for more and most certainly justify the £1.99 price tag. Simply put Rayman Jungle Run is one of the best smartphone games of the year. With beautiful animation, stunning environments and instantly accessible controls, each level is like a crazy roller coaster ride. The gameplay is utterly addictive, if a little infuriating at times and while it’s a shame that it has yet to be optimised for the iPhone 5, it is a must purchase app for any self-respecting mobile gamer. If you do buy it however, I must recommend a heavy-duty protective case for your phone for when you inevitably rage-quit and hurl it across the room!